No, I'm not talking about the one who is probably New Zealand's most famous present-day John Campbell. It's the historic ones who make me sigh deeply. Back in 2007, I was asked to pull together a quick broad-brush summary of the developmental history of the early North Shore of Auckland. This meant gathering information which appeared sound enough, but to do so quickly. One of the sources I found at the Auckland Research Centre in the Central Library was Ralph Johnson's “The Conception and Birth of North Shore Suburbs from Mother Auckland in the Nineteenth Century”, an RCJ Stone research topic, 1991 (unpublished). In it, it repeated an oft-told story how the original surveyors of the North Shore's Mahurangi Block from Maori in 1841 was Alan O'Neil and ... John Logan Campbell. And I fell for it. I don't mind finding out I got things wrong. It's galling, sure, but finding out the right information makes up for it. Trouble is -- there are too many John Campbells. I've found three possibles. None of them have any hard-and-fast evidence attached to them saying "yes, he's the one." This one has the most going for him as the John Campbell surveying in Auckland in 1841 -- but it isn't known whether he was up here, or whether he came in as part of the New Zealand Company settlements around Wellington. He died early, as well. At Wellington, on the 2nd instant, John Campbell, Esq., formerly of Edinburgh, aged 29. Mr. Campbell was originally bred to the profession of the Law, but having emigrated to New Zealand, he was employed as a Surveyor by the Local Government, for which his scientific acquirements particularly fitted him. Subsequently he was appointed Protector of the Aborigines at Taranaki, and it is much to be regretted that the liberal and enlightened views which he entertained as to the relative position of the European's and Natives, and his anxious wish to promote the interest of both, have been frustrated by his premature death. He was much respected by all who knew him; his funeral was attended by most of the officials connected with the Government and the New Zealand Company, and upwards of a hundred Natives. This one could be one man, and it might even be two. On the plus side, he was documented in Auckland in 1849 (New Zealander, 10 March). On the minus side, the next reference is to a John Campbell, surveyor, dying in a hotel in 1866. 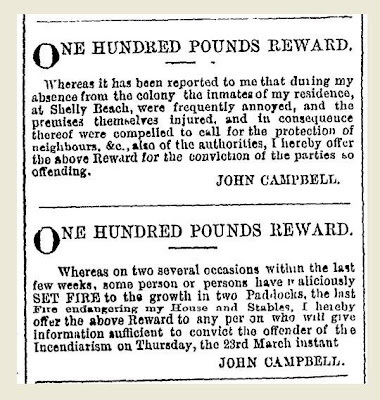 John Campbell, a surveyor, fell down while standing at the bar of the hotel where he was residing on August 27 and died shortly after. It was found that serous apoplexy was the cause of death. 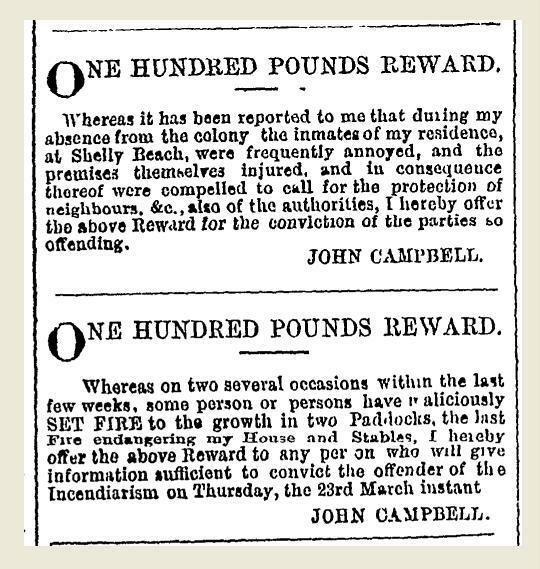 You start to realise as well, after reading of the John Campbells through Auckland's early history who seem to feature prominently in the court reports for drunkenness and larceny -- why John Logan Campbell held on to that middle name of his. This one left behind a will attached to his property records that is so detailed (because he was concerned pretenders might crop up claiming a share of his estate due to made-up familial connection) that he essentially included his genealogy in the document, along with all the long list of property he held in this country. This is the Last Will of me, John Campbell in the Supreme Court of the Town of Auckland in the Colony of New Zealand, [illegible], and I do hereby revoke all wills by me made heretofore. I employ the term “will” in this instrument as extending to and including every kind of testamentary disposition whereas there are many persons of the name of Campbell, my surname, and it may happen after my decease that persons bearing that name but not related to me by consignment, or affinity and of whose existence I have no knowledge may appear claimed to be legatees or devisees upon this my will. I do hereby make the following statement touching my family and relatives (none of whom are now in this Colony in order that no persons may derive any interest as such legatees or devisees [illegible] and [illegible] only the several persons for whom the same is intended. That is to say my father John Campbell was a small farmer and the son of a small farmer and was domiciled in the townland of Coole in the Parish of Clonol (?) in the County of Tyrone in that part of the United Kingdom of Great Britain and Ireland called Ireland. He has been many years dead. The farm which he rented in the said townland belonged I believe to the Earl of Blessington and the townland itself formed according to report a part of the “Mountjoy Estate”. My mother Elizabeth Campbell was the daughter of Matthew Campbell and his wife Mary Lapin. My father was the son of Brien Campbell and Catherine Morris or Maurid, commonly called Kate McMaurrish. Whether Brien or Bernard was the Christian name of the said Brian Campbell I cannot say but he was called and best known by the said name of Brian Campbell and his mother whose maiden name was Develin was the author of some ballads and other poetical productions in the Irish language. The mother of the said Kate McMaurrish was the daughter of one McRory and the mother of the said Matthew Campbell, the father of my mother was the daughter of one Ottagan, and the mother of the said Mary Lapin was the daughter of one Woods. My father was twice married, first to my mother the said Elizabeth Campbell, and secondly to Bridget Hagen, a widow, whose maiden name had been Bridget Cory. By his marriage with my said mother Elizabeth my father had four sons and one daughter, namely Bernard Campbell, myself John Campbell, Neal Campbell, Matthew Campbell and Mary Campbell. My said brother Bernard died about the age of fifteen years, and my said sister Mary died about the age of two years. My said two brothers Neal and Matthew are, I believe, now living. In the month of February, one thousand eight hundred and thirty-three, when I left Coole aforesaid to enter into the service of the ordinance survey at Dungannon in Ireland aforesaid, my said brother Neal was married and had one son named John Campbell. My said brother Matthew married since I left Coole aforesaid. After my return [illegible] for Australia in the year one thousand eight hundred and forty-one. One Catherine McGuinness and both he and his said wife Catherine visited this colony about the year one thousand eight hundred and fifty-two whence after a residence of about five months they returned to Ireland. They had no children there nor have I heard of their having had any since. By his marriage with the said Bridget Hogan my father had but one child, a son named Thomas Campbell. I left my father’s house at Coole aforesaid in the year one thousand eight hundred and thirty-three to enter as aforesaid into the service of the ordinance survey of Dungannon aforesaid under one Captain George Dalton, and upon my retiring from such service in the year one thousand eight hundred and forty, I was serving in the division of one Lieutenant Beatty. I left Coole aforesaid for Sydney in New South Wales by way of London about the month of April one thousand eight hundred and forty-one and I arrived in Sydney aforesaid in the ship “William Turner” in the month of October. Thence next moving in the early part of the year one thousand eight hundred and forty-two, I left Sydney aforesaid in the ship “Challenger” for Auckland aforesaid where I landed in the month of February in the same year, and permanently settled. In the year one thousand eight hundred and fifty, I sailed from this colony in my own schooner the “Sir John Franklin” for California, whence I returned after an absence of about thirteen months by way of New South Wales aforesaid. My said half-brother Thomas Campbell entered into the service of the said ordinance survey in the year one thousand eight hundred and thirty-four or in the year thence next ensuing, and upon my retiring therefrom at the time aforesaid he was serving [illegible] under the said Lieutenant Beatty. And only then did he talk about who was going to get what and why. His main estate here in Auckland, Campbellville, was bounded by Wallace Street, Jervois Road, Shelly Beach Road and the Waitemata Harbour. He's on the list only because, yes, in Ireland he served during the ordinance surveys there -- but that doesn't make him a surveyor, and by the time he got here, he was effectively retired. He was, though, quite wealthy, a good Catholic, and had a lot of problems trying to keep pleasure-seeking, pheasant-hunting, shell-gathering and Christmas pohutukawa blossom-nabbing Aucklanders off his land. 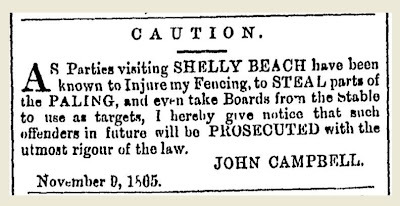 John Campbell, of Campbellville, Shelly Beach, was charged with a breach of the 14th clause of the Dog Nuisance Act, by suffering a dog to attack a boy named Thomas White, on Shelly Beach on the 21st instant. The Commissioner of Police put in the Gazette proclaiming the boundary. Thomas White deposed : I saw defendant on Sunday, the 21st instant, about half a mile from Shelly Beach — this side of it. George and John Hunter was with me. We were coming round the beach. The tide was out. Mr. Campbell called us and we waited until he came up; he had a dog with him, I cannot say it was his dog. He struck me and the dog flew at me, tore my trousers and knocked me down. The dog did not bite me; he took the buttons off my waistcoat with his paws. Mr. Swailes came round the beach, and Mr Campbell left off beating us and the dog went away with him. The dog went up the hill with Mr. Campbell and lay down on the verandah of Mr. Campbells house. Cross-examined by defendant: The dog was a brown one about eighteen inches high. The dog threw me down before you struck me. George Edward Hunter deposed: I know the last witness. I live in Victoria Quadrant. On last Sunday week I was walking towards Shelly Beach with the last witness and my brother John Hunter. We had been round the point, and coming back, when within 40 or 50 yards of Mr. Campbell s place, he called after me; he had a brown dog with him; the dog flow at Thomas White and tore his trousers and some buttons off his waistcoat, and pulled him down on his knees. When Mr. Campbell went away the dog followed him up to his house. The dog afterwards came out of the house with another man. Examined by defendant : l am not aware that I had been on your ground. We did go inside a fence to get a drink at the well. I am sure that White was not climbing up the pohutukawa tree. I saw White fall by the dog. You struck me first and then I got out of the way. I did not run a way to the far end of the beach. I did say I would summon you. I do not know that White fell himself upon the slippery rocks. 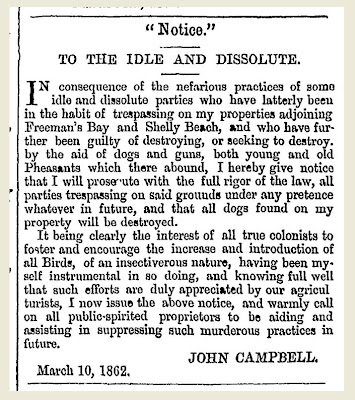 Corporal Smith deposed: I know Mr Campbell’s residence; it is within the boundary of the Dog Nuisance Act. The same defendant was then charged with assaulting the same witness by striking him with a stick. He admitted that he beat the boy with a rod, and complained that his property was trespassed on and the trees injured. He was at great expense to preserve his trees, and the boys would not give their names so he beat them. He was sorry he did not give the big boy more, and also sorry he gave the complainant so much. The Court said that, although the dog might not have been defendant's, it being in his care at the time he was liable for its acts. He was fined 40s. and costs; and in the second case— the assault— he was also fined 40s. and costs, or fourteen days' imprisonment. Mr. Thomas Batts, of Springbank, writes complaining of the treatment he received on Christmas Day from Mr. Campbell, of Shelly Beach. Mr. Batts admits that he was trespassing on Mr. Campbell's paddock, and that he had his wife and children with him, but he states that he had been led to believe that the public had a right of way. From our correspondent’s statement, it would seem that he was undeceived in a very menacing manner. However, there is this much to be said, that Mr. Campbell suffers much about holiday times from trespassers breaking and destroying his shrubs and young trees, and we dare say his patience was pretty well exhausted when he encountered Mr. Batts. 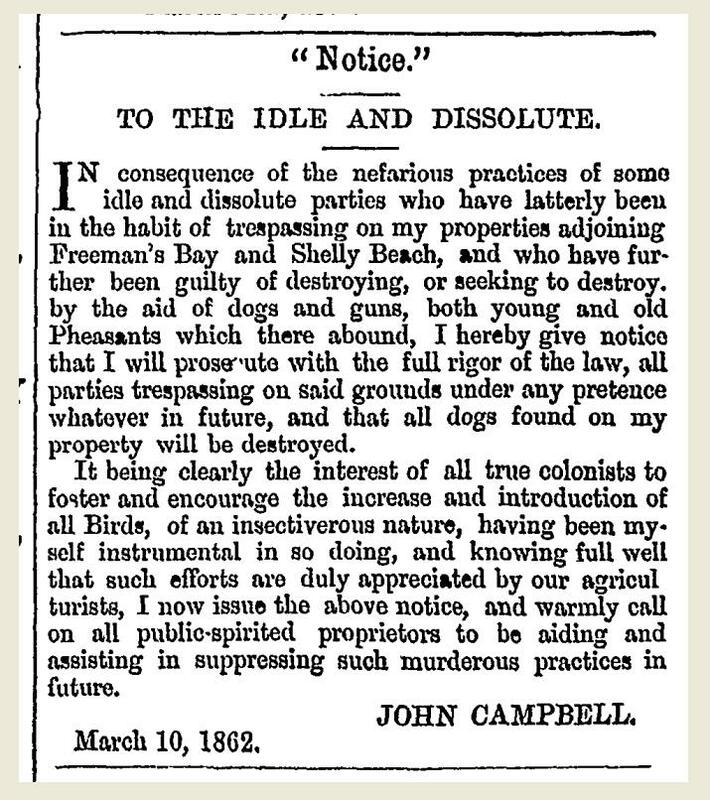 Indeed, we know that there has been a great deal of wanton mischief done to Mr. Campbell’s property; and it is difficult for anyone in his position, at all times, to draw the line as to who should be courteously received and who should not. THANKS. 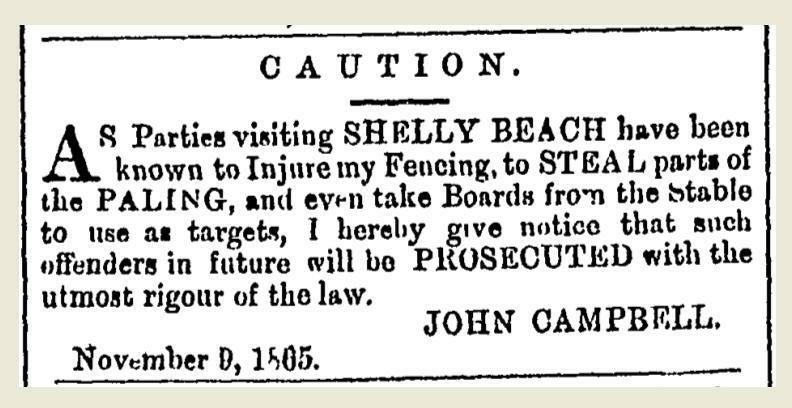 THE LADY SUPERIOR of the NAZARETH INSTITUTION (for Natives and Half-castes) desires to return THANKS to Mr. J. C. CAMPBELL, who presented that Institution with an Acre of Ground at Shelly Beach, for building purposes. Mr. Campbell on a former occasion laid another institution under similar obligation. The funeral of the late Mr. John Campbell, of Shelly Beach, took place yesterday, and was followed by no less than 300 citizens. The body was interred in the Roman Catholic Cemetery, Symonds-street. The Rev. Father Norris read the funeral service at the grave very impressively, and the Rev. Fathers W. McDonald and Golding also took part in the obsequies. But -- this still doesn't help sort out just which of these John Campbells surveyed the Mahurangi Block.